‘Oh boy, 24 hours on a boat’ – that was my first thought when my partner asked me to go to Greece and travel there by ferry. Why so long? Of course the main reason was that we had a low budget but a hungry heart: we wanted to travel around and see different islands while spending as little money as possible. The only way we could afford to do so was by buying the Greek Island Interrail Pass. And you are about to find out why this is the best way to explore the Greek Islands of Santorini, Naxos and Amargos. The pass allows you to take two international trips between Italy and Patras and four domestic trips around the Greek Islands. We had a lot of places in mind, but after months of prep and research, we found our winner islands: Santorini, Naxos and Amorgos. 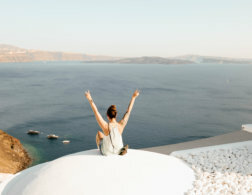 This is a guide to some of my favorite places and experiences on all three islands – and they are proof that island hopping is the best way to explore the Greek Islands! 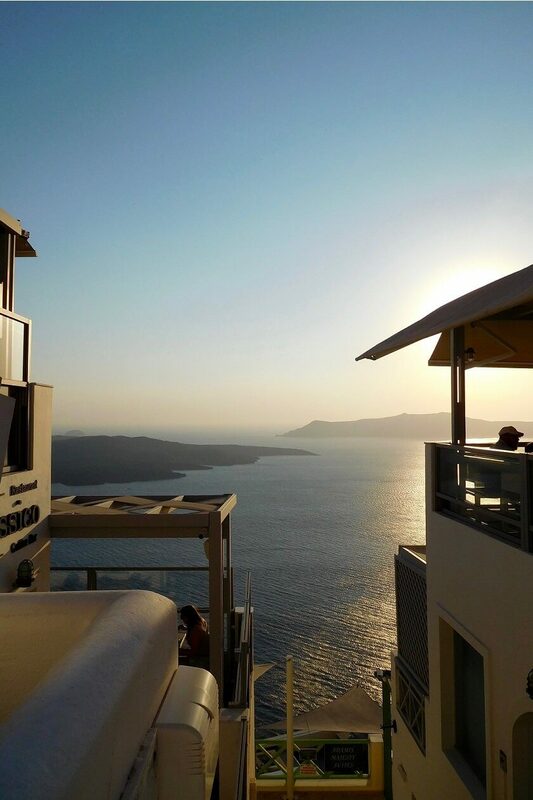 The sunset on Santorini is really extraordinary. Anyone who has ever been to Santorini will tell you that, right? So trust me when I say it really is – and Fira is a great place to see it! Go for a walk around 6pm, meander around the small white streets and enjoy a cold drink; around 7.30 pm sit down in a restaurant to savor some delicious Greek food and watch the sun slowly disappearing into the sea. Magical! 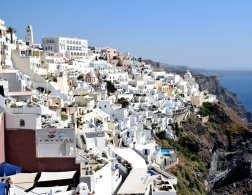 Oia is a pearl; it is Greek beauty at its best. We went there for dinner and really enjoyed the trip. 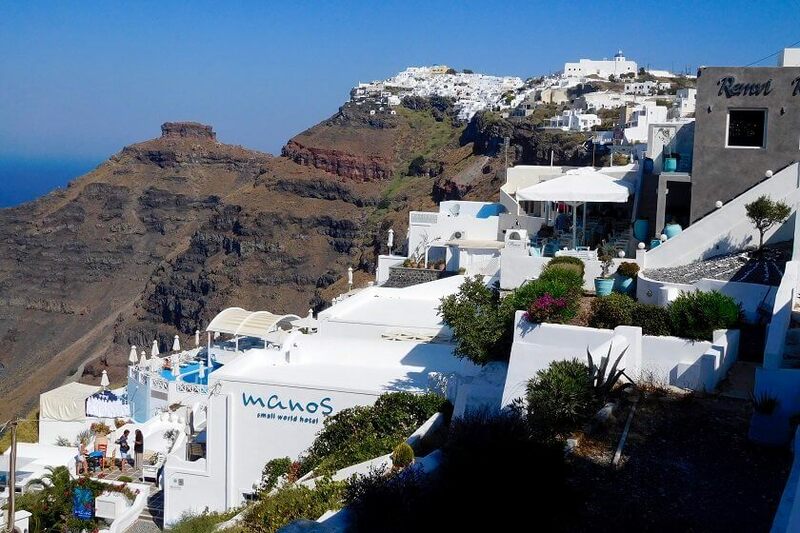 I thought it more elegant than Fira – it has nice shops and wonderful views. At night, it is well illuminated and it’s lovely to spend the evening wandering from photo spot to photo spot to soak it all up. 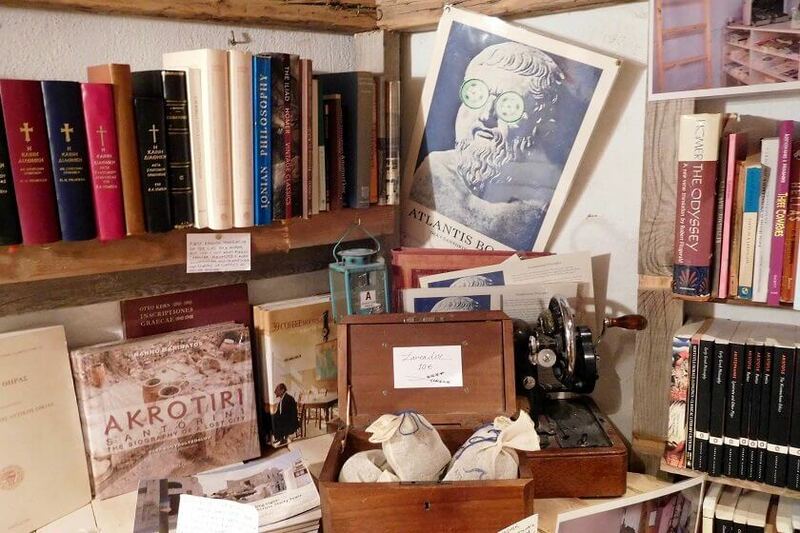 If you have a little more time, head to the famous Atlantis Books bookshop, a magical place where you can find books in different languages and relax on their terrace with one in your hands. If you want to breathe in the rich and authentic Santorini’s atmosphere, I recommend you to visit Firostefani and Imerovigli, two small towns that offer great views of the island and great hotels too. How weird to recommend a town for its hotels, right? 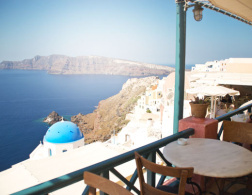 But on Santorini the location of your hotel can really make or break the trip! Hotels in Firostefani and Imerovigli are marvelous: they blend in with the hilly environment, have amazing pools and unimaginably beautiful spots where you can savor your daily breakfast. It’s nice to absorb some beauty in preparation for the winter months! You can reach Firostefani by scooter and then walk up until Imerovigli by following the pedestrian path. Naxos is a paradise for those who love the sea and spending days by the beach. On our first day we went to Aliko beach, which is quite far from the harbor (especially if you are driving just a small scooter) – but it’s totally worth it. The beach is also close by a cedar forest where you can experience wild nature, soft sand and blue sea. We might have even gotten lost a little bit finding our way back towards the end of the day… Usually there are very few people here which makes it an even better place to spend a relaxing day! Chalki is the old capital of Naxos island. It’s worth a visit because it is very typically and picture-perfect Greek! There are two churches with stunning frescoes worth visiting: the church of Panagia Protothronos and the church of Ag. Georgios Diasoritis. Sometimes, you’ll find volunteers who will keep the church open and tell you the story of these beauties. I am passionate about art and culture, so when I travel I like to visit heritage sites in my destination. Naxos is famous for its marble quarries, which you can see everywhere around the island. An interesting result of this natural attribute is the ‘Kouros’. They are enormous marble statues which have been abandoned by their sculptors for various reasons. We visited the Kouros of Melanes, which is a “graveyard” of marble statues that broke before they could be transported to their buyers. The artists simply left them there. It’s cool to see what ancient people were capable of doing with this heavy rock! 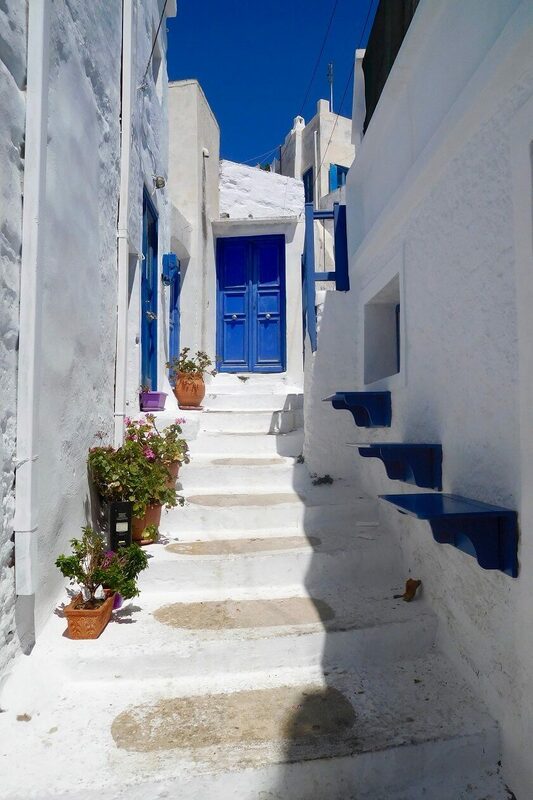 If your accommodation is not in Chora, the old and main town of the island, you should at least come here for a visit. 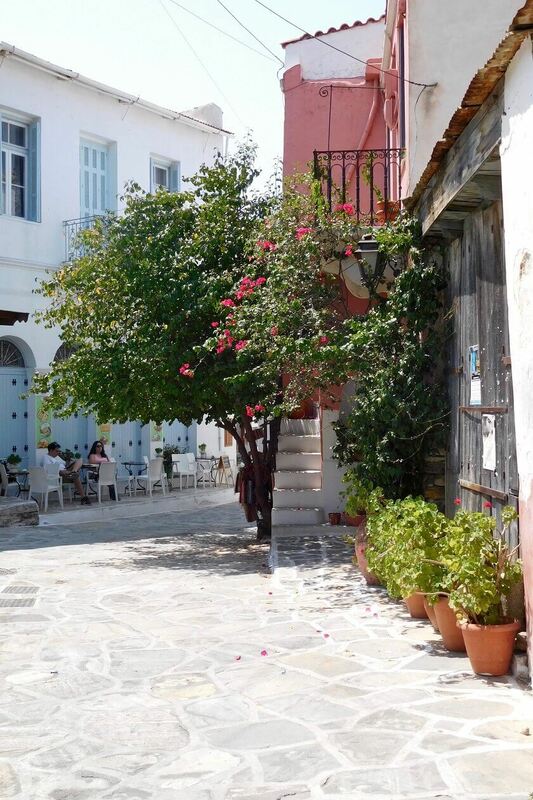 It is a very typical Greek village: narrow streets, its white houses and lots of nice cafes to just sit and people watch. Don’t make too many plans; just take a walk, enjoy the slowness of Amargos and finally sit down to taste a Greek yogurt with honey and fruit – seriously delicious! The key to this island is to relax, so simply embrace it! 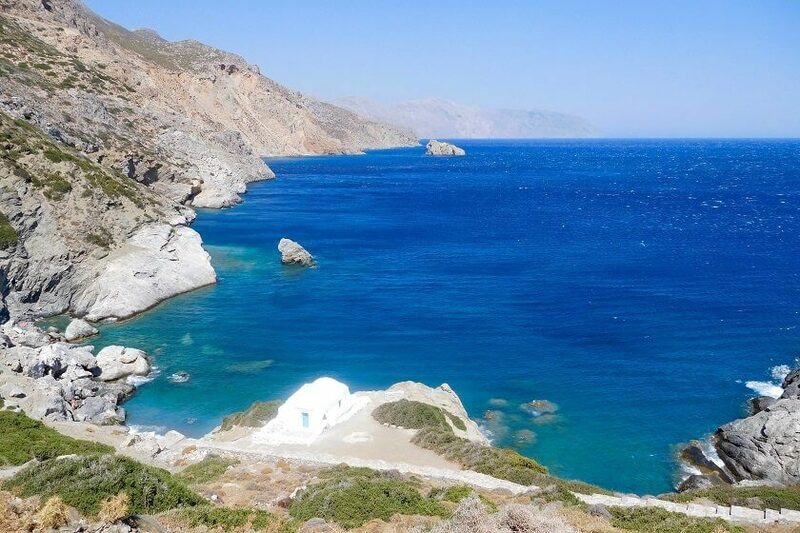 Amorgos is famous for its blue sea, so why don’t you enjoy it at the best beach available? To access the beach of Agia Anna you need to go down a hill. Don’t expect to find lots of space because it is set in-between rocks. However, it’s a great place for you to go for a swim, sunbathe and try snorkeling or scuba diving. After a relaxing day by the sea, we decided to walk up one thousand (yes, 1,000!) steps and reach the well-known Monastery of Hozoviotissa. The site is built into a cliff at 300m above the sea level. You can even visit the monastery’s interior, where the monks will offer you handmade sweets and drinks. 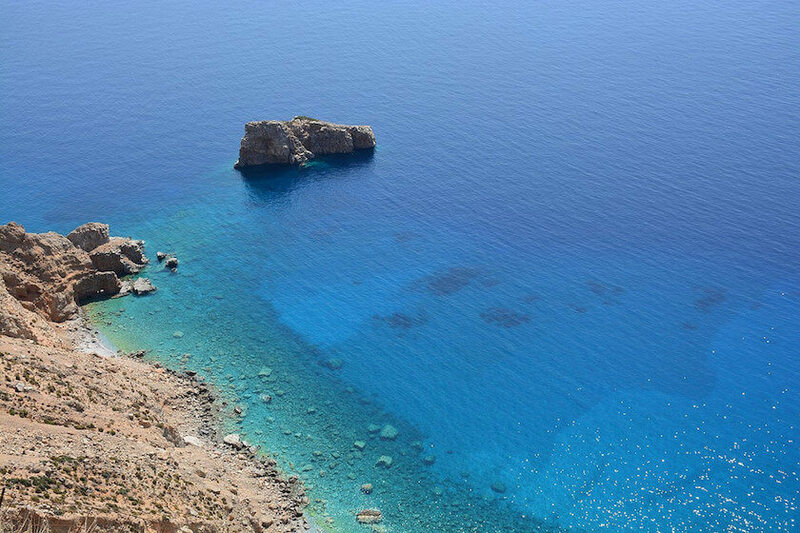 The view is spectacular: it gives a sense of freedom and it’s a great spot where you can admire ‘le grand bleu’ – the sea of Amorgos. All the effort you spent climbing it will be worth it! Are you convinced? Then pack your suitcase to explore the Greek Islands now! 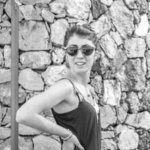 This is a guest post by Giulia. Giulia is an advertising and marketing student with a genuine passion for the arts and everything creative. She is an explorer and loves traveling to discover new cultures and places. Born in Italy, but with a global heart, she loves spending time reading, eating chocolate and practicing yoga. 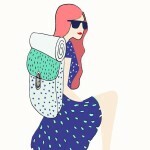 Follow her adventures and get closer to art and beauty on her blog Art With A View and her Instagram @artwithaview_9. Greece is on top of my bucket list. It looks so beautiful, I'd go crazy just photographing the islands!